We have straight forward, transparent subscription fees versus negotiating with salespeople. In addition, for Instructor Accounts we don’t have a minimum number of seats you have to purchase, making it easy for you to start a pilot run with only a few students. As advertised on our viral YouTube videos (youtube.com/abcsofchinese), with a free trial account you can learn the 30 most frequently used basic components. This is a sample of the “Straight Frequency” playlist from our Chinese Component Mastery Course. These 30 basic components combine with each other to form nearly 180 different Chinese characters. Aside from these 180 characters, these 30 simple components also appear in over 2,500 other Chinese characters! So by knowing them, you will be one step closer to being able to read and write over 2,500 characters! After completing the exercises for these 30 components you’ll need to upgrade to a subscription in order to learn the remaining 370 components and to learn the Chinese characters you unlocked. Alternatively, you can upgrade to a subscription at anytime to access the other curriculum playlists. That is to say, it’s not necessary to first complete all 30 before upgrading. After you create a Free Trial Account and sign in you can choose your desired subscription in Profile Settings (the gear icon in the main menu). In order to access all 400 basic component exercises and playlists in our Chinese Component Mastery Course, along with all of the upcoming Chinese Character Course exercises and playlists, you will need to upgrade to a subscription account. After you create a Free Trial account you can upgrade by (1) signing in, (2) navigating to the Subscription Status menu in User Setting –the gear icon in the main menu– and (3) choosing a paid subscription plan. Instructor accounts are good for one year from the date that the subscription is created, and will be automatically renewed at the end of that year unless it’s canceled. In addition to the instructor being able to work through the curriculum, an Instructor Account also includes 1 extra account for a student. That student account will have full access to our Chinese Component Mastery Course and Chinese Character Course for the duration of the Instructor Account subscription. If you have more than one student, at any time instructors can add additional Student Accounts under their Instructor Account for the discounted rate of only $9.95. 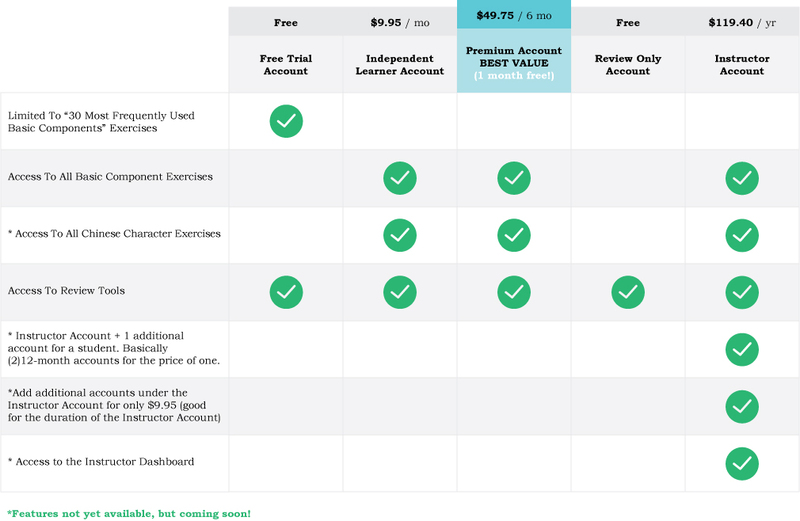 So basically an Instructor Account gets (2) 12-month accounts for the price of one, with the option to add additional student accounts under the Instructor Account for only $9.95. Student Accounts are good for the duration of the Instructor Account subscription. Once the Instructor Account subscription expires, all of the Student Accounts also expire. When it comes time to renew the Instructor Account, the instructor can choose which Student Accounts he or she wants to renew, and which can be deleted. An Instructor Account has access to the Instructor Dashboard where the instructor can manage and monitor the learning activities all of the student accounts in his or her group. In the Instructor Dashboard there is also a tool to customize and create your own content playlists to assign to your students. With a FREE Review Only account you can access the tools in the ‘Review’ menu in order to continue practicing the Chinese components you’ve already learned, but you won’t be able to learn new content. We understand that sometimes money can be tight and sometimes people get busy with life and can’t commit as much time to developing a skill as they’d like. That’s why we offer this free “Review Only” account option. It’s a downgrade option for users who need to take a short break from learning new content, but don’t want to lose all of their progress by closing their accounts. To cancel a recurring paid subscription and avoid future charges, you can downgrade to a Review Only account before your next subscription renewal date. You need to change to a Review Only account BEFORE the next time your paid subscription automatically renews, but your account won’t be downgraded to Review Only until THE END of your current paid subscription period (after the renewal date passes). In other words, this effect won’t take place until any current paid subscription expires. You can upgrade to a different subscription at any time to continue learning new content again by (1) signing in, (2) navigating to the Subscription Status menu in User Settings and (3) choosing a paid subscription plan.